I am currently working through some fairly tedious passages of mark making on one of my pieces, so yesterday I decided to give myself a break and have a play. Stitching on a piece of bubble-wrap envelope presented itself. Apart from using different colours of thread, the other change I made between the two pieces was to have one that was stitched in a fairly regular pattern and one which was stitched as randomly as I could manage. The ‘back’, here is where the differences reveal themselves. Our Urban Sketchers group met today four our first ‘official’ winter sketch of the year. The complete lack of sun didn’t deter our group, 24 hardy souls turned out. As I am recovering from a really nasty cold I was happy to find a spot inside a coffee shop with a bench seat looking out the window to a collection of umbrellas. 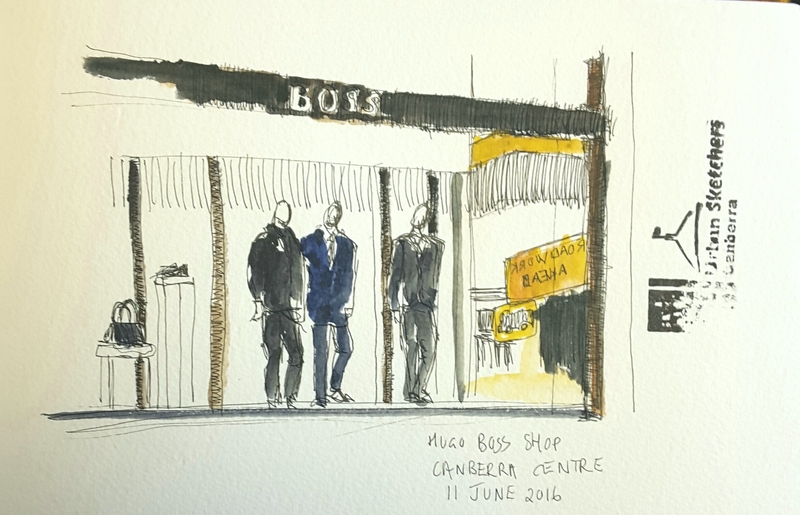 Eventually the sun broke through the fog so I made a second quick sketch of one of the shop windows. I only had limited opportunity to sketch while I was in Singapore in May. 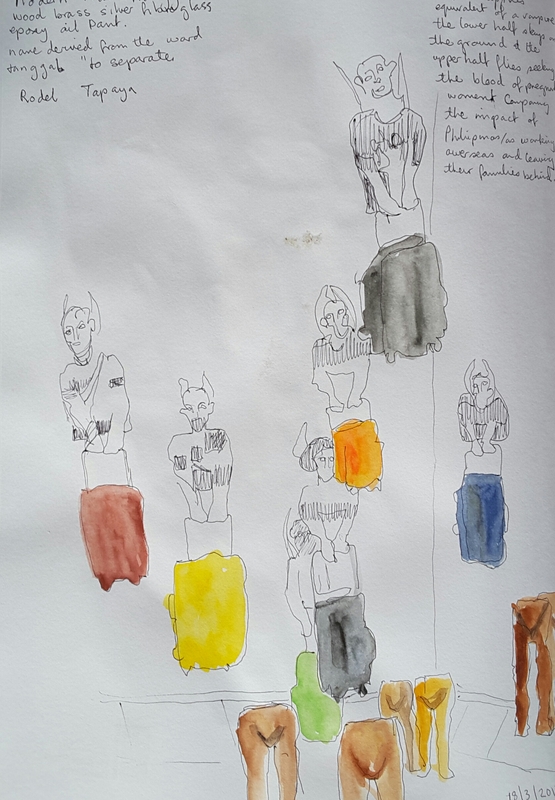 Travelling with non-drawers meant that sketching was more of a challenge. We did make it to the National Gallery of Singapore which is interesting not only for the art it contains, but also for its new architectural structure that joins and transforms two historic buildings, the former Supreme Court and City Hall. The joy for me is finding artists whose work I haven’t seen before. I’m a bit of a modernist so it’s no big surprise that Dora Gordine’s sculptures caught my eye. Because the gallery had quite a number of Gordine’s sculptures I assumed there must be a strong link to Singapore. However I haven’t been able to find a link other than that she was commissioned to make sculptures for the Singapore City Hall in 1935. Gordine worked mainly in London. The work below was made in 1949. I can’t leave the NGS without mentioning the paintings of Georgette Chen. 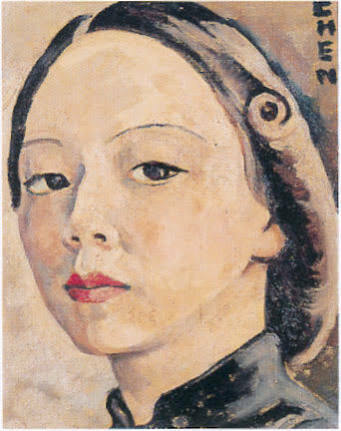 This striking self portrait was but one of her works in the collection. Not all the artwork in the city is in the galleries. I saw several statues by the sculptor Fernando Botero, whose work often exaggerates it’s subject, in this case a bird. At the Museum of Asian Civilizations I saw the exhibition Joseon Korea, which was full of engaging and colourful works. This wooden sculpture was in the section on religious practice. The Empress Place building (1867), which houses the main part of the museum, was originally government offices. Now it houses a range of historic exhibitions which I only managed to fly around quickly in the time I had. However I did manage a sketch of this contemporary work by Eng Tow inspired by grains of rice. The grains are several metres in length and were hung suspended in the gallery space. One last sketch from the waterfront with a storm passing in the background.